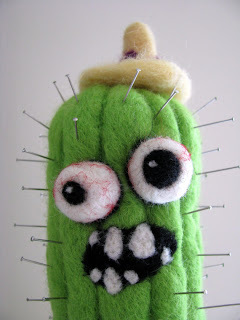 ionlylikemonsters: Zombie Cactus Pin Cushion! This cactus pincushion will look extra spiky with all your pins in place. Or just keep him out as a decoration. The sombrero is just pinned on, so you can remove or arrange it as you choose. He is even lower maintenance than the real thing. The extra bonus being that he is already undead, so he can't go and die on you no matter what you do. 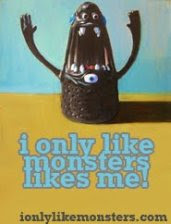 If he gets feisty, just add more pins to keep him in line. 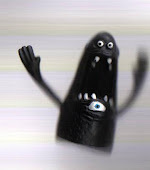 If he starts to stalk you, you'll know instantly by the clomp clomp clomp of his planter. It's a nifty little zombie protection feature, and it could save your life. He is my largest zombie yet, he is 8.5 inches from table to the top of his sombrero. Needle felted from 100% wool, he has his eye on you. The other eye, well, it's kinda looking past you, but don't think he doesn't have you in his sight! He's willing to earn his keep. Do you have dead-beat kids who just won't move out? Are your house guests overstaying their welcome? 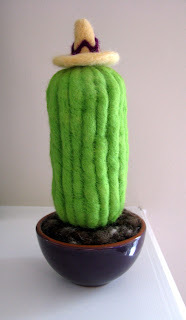 Place this cactus on the nightstand in their room. 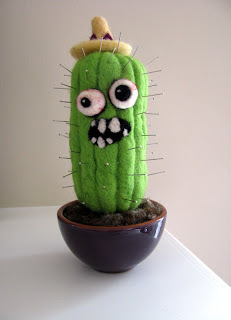 Just a plain, unassuming cactus, nothing to see here. 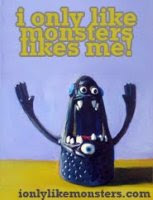 Then, just before bedtime, sneak in there and turn him so the zombie side is visible. The next morning they will be packed up and on the road before you're even out of bed. That is value for your money, my friends!